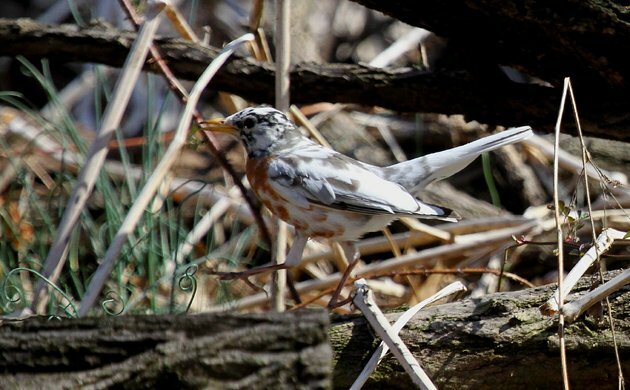 Since at least 2009 there has been at least one hypopigmented, or piebald, American Robin living in Alley Pond Park in my home borough of Queens, at least for the breeding season. It (or they? *) is assumed (confirmed?) to be nesting there each year but all I had ever managed were fleeting glimpses and couple of lousy photos. That changed on a recent visit when the partially leucistic bird and its mate decided to cooperate for me and my camera. I am relatively certain that this bird is a female, as the bird it was associating had the darker head that tends to indicate male robins. 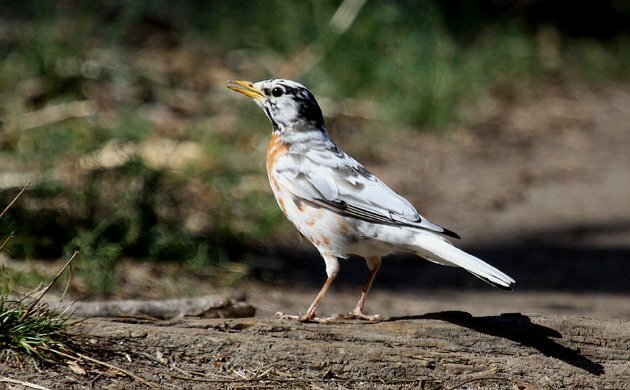 Not only that, but the leucistic bird’s companion sang several times as well. It’s nice to see a bird that can be recognized as an individual and here’s hoping that she keeps coming back for many years to come! *I am certain that the particular bird in these photos has been around since at least 2011 but the bird(s) in earlier years might be different, perhaps the parent of the bird in this post. That’s great that you were able to get proof that the bird has mated. 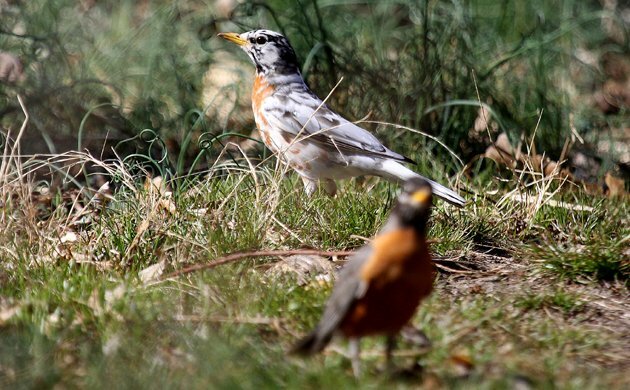 Over the past couple of years we have noticed more than one robin with varying color patterns and we had to wonder was the original bird breeding. Now we know! @Jean: For the record, I have no evidence that this bird is breeding. I assume that they are a mated pair because they were closely associating. I saw a similar Robin on two separate trips to APP (west side of Turtle Pond) within the last week. I could not get a good picture but it was openly flying around for quite a while. I’m not sure if it was the same bird; I thought it might have had more white. I just contacted Caroline and Chris and we are meeting for drinks (those famous martinis!) at Caroline’s house on Wed, Oct. 22. Everyone hopes to see you then or another time soon. There is one very similar bird in Shelburne, Ontario (last seen 05/29/2015).